Hi everyone. The basement sim is starting to get a fair numbers of followers over on YouTube, and one of the common questions I’m getting is about the dimensions of the sim. I used Google Sketchup as a basic CAD program in the design, but made some modifications so the original Sketchup file isn’t ready for sharing. So today I just got out a ruler and made some measurements, and drew the attached. I hope it’s helpful to those thinking about building their own GA cockpit, and I’ll try to get the Sketchup file posted eventually. Here’s the basic dimensions, all in INCHES. You may click this to make it larger or right-click to download it. If you would like a PDF of this, you may download one here. And if you would like the real-world-sized PDF of the Cessna 172 panel that I used for the panel, you may download it here. I hope this helps. First off, VERY COOL!! I have a question about the main display that you chose, perhaps I missed it? Why did you go with the short throw, as opposed to just another flat panel, say a 47″ or so? Was it for FPS, or weight, or ?? I run 3 32″ Vizio’s and can only hit about 23 FPS in dense areas (on a good day) I average about 16, but sometimes drops as low as 9. I mainly run FSX (boxed) but recently purchased P3D and working on setting it up now. I was going to ask the same question. I didn’t read through everything on this site, so he may have mentioned it somewhere. I run 3-60″ displays on my rig and one display measures 53″ across, so that would fill.the 46″ dimension he has for the front view. Just seems like a better idea over using projection. LED displays are brighter and have a sharper picture. IDK maybe he already had the projector laying around. There must be a reasonable answer? Hi guys. Sorry, Tommy, that I missed your question first time around. Good luck with the setup! The reason is field of view. While the front window is about 46″ in diagonal, from the seats in the cockpit the actual field of view to NOT see the edges of a TV screen is much wider, especially if you want both the left and right chair to have an immersive view without edges. The projection screen hangs two inches in front of the front edge of the cabin. It’s a 100-inch screen, and even with it if I lean forward too much over the glare shield I can see the edge of the screen. One option would be to tilt-mount a big display to the front slanted lumber, but that would probably not look immersive as the viewing angle would be at a significant degree. I would love to have a TV for the front view just to have similar view quality all way around, but 100-inch TVs are a bit out of the price range right now (NEC makes one for $33,000 – the price of a nice used Cessna 172l; Sharp makes a 90 inch for six grand). Personally I also like the projection screen because I can look around the edge of the window a bit to find the field on final approach, just like in the real world. Thanks for the reply. I understand your reasoning now. If you had the front monitor away from your build, say six or more inches then you could see the bezels.. But if you had the monitor right at the opening, like you do with your side monitors, then you wouldn’t see the bezels because your opening is only 46″. Hope I explained that right. Does that make sense? Anyway I will test out this theory because I’m going to build one similar to yours and Flight Sim Liberty.. I’ve already built a Lear45, but want to do a GA build next. Not saying a projector is bad or anything, because triple projectors are used in a lot of builds, but I just prefer the clarity of LED and the ease of implementation. I also have another question if you don’t mind? Saitek yokes. I see you use them and how do you feel about them? I’ve always used CH Products and had very good luck with them. I had a chance to use the Saitek Cessna edition and I was not impressed. While making a controlled turn and applying a little back pressure, it sticks. It is not a smooth experience. I’ve seen a lot of fixes for them, but it seems like a common defect. Did you do anything to improve yours? Sorry, if you mentioned it somewhere, but I haven’t gone through everything on your site yet. You have to remember that the front of the sim is sloped. So while the front projection screen is only two inches from the cabin where the base of the panel rests, it’s 15 inches away from the top of the cabin. That makes for a much wider field of view at eye level. In terms of the yokes, I had a Saitek Pro yoke which was sticky and a constant source of USB-related problems. I replaced it with a Saitek Cessna yoke, and in fact had two, one for each position. They worked great, were very smooth, and I had no complaints. But as I got into my real-world flight training I wanted a yoke that had a much more real-world feel, both in not having a detent, and in having the heft you feel when you pull on a real airplane. After much research I got the Yoko yoke for the left seat, and I have not regretted it one bit. It’s a fantastic piece of equipment. Nope…on the Yoko.. Almost a thousand bux and no FFB.. Sorry, but that is way over priced. If it had FFB then it might be a consideration, but the mechanics inside can’t be that good to justify that price. You should open it up and show some pictures. 🙂 I’m sure there is not a thousand bux worth of parts in that thing. Not worth it for you, worth it for me. I’ve not felt anything close to a real world yoke other than this, and my primary goal is something that feels and flies very close to my real world training. The Yoko does so, and I’ve not regretted the purchase. The good news is that you don’t have to buy one if you don’t choose to. Ok cool, glad you’re happy with it. Without FFB you’re still just pulling against the tension of springs or bungie cords. There is no haptic feedback on what the plane is actually doing. So in the long run the consumer is paying for better build quality and smoothness, but the basic mechanics are the same as a $150 yoke. It´s AMAZING !! I live in Brazil and my English is not so good 🙂 I tried to find out the information about the panel thickness but I couldn´t find it ! Could you provide this dimension please ? I´m planning to build a similar cockpit and now I´m gathering all necessary informations to start my project !! But I´ll run my aircraft over the x-plane 10. I noticed that the GTN750 works only with FSX or Prepar3D ! Am I correct ? Do you know if some GPS works with X-Plane ? Congratulations for you job and continue posting more videos (maybe in the future flying over Brazil). Have a good day !!! Hi Samuel. Thanks for the comment and questions. The panel is 1/4 inch MDF. It’s quite thin. There is a GTN 750 for X-Plane as well – a Google search should find if for you. Good luck and thanks. I stumbled upon your YouTube video and was hooked from there.. I bought a cheap panel years ago to house my Saitek perpetuals but the dimensions are way off. After seeing your build II was inspired to start building my own. 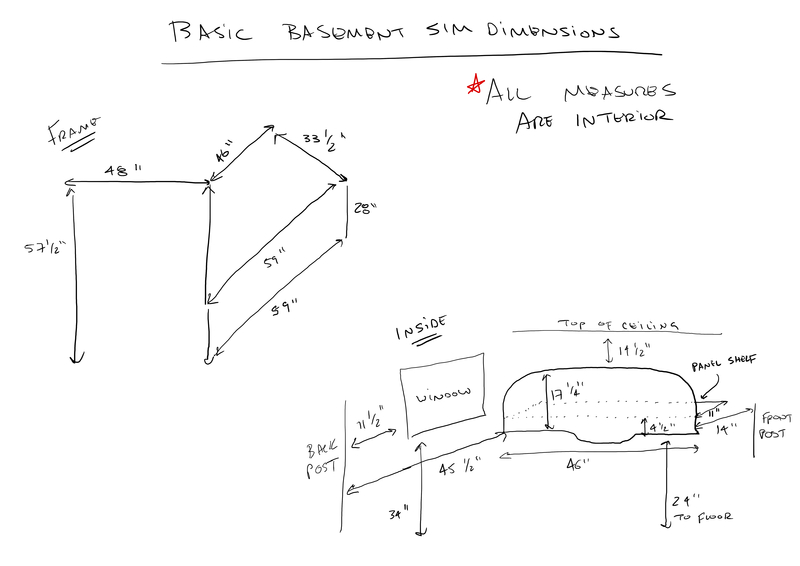 On your PDF ” Basic Sim Dimensions”, Im confused by the upper left drawing and how to orient it.. The bottom right drawing from the post to the window is 11 1/2″”? Also what short throw projector did you use? Its simmers like you that keep the community alive. Hello! This is great. Thank you so much for sharing with us. Please, can you share the sketch file?